I work in a private practice setting where everything that is said is confidential. However, I refer my clients to other clinicians, nutritionists and M.D. 's when needed. I will also consult with professionals in various fields that are related to eating disorder research and treatment. Mothers, fathers, husbands, boyfriends, sisters, brothers, sons and daughters call me to make appointments for the woman they care about who has an eating disorder. These people love and are worried about the suffering person. They may be looking for ways to convince their loved one to go into treatment. They may be helping that person by doing some scouting to find out what may be available in terms of treatment, and during their research they found me. THIS NOTICE DESCRIBES HOW MEDICAL INFORMATION ABOUT PATIENTS IN MY PRIVATE PRACTICE MAY BE USED AND DISCLOSED, AND HOW AUTHORIZED PERSONS CAN GET ACCESS TO THIS INFORMATION. Officially One of the Best Eating Disorder Recovery Blogs in 2012! Wow! 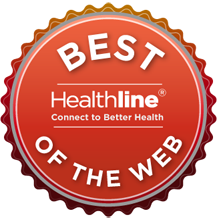 EatingDisorderRecovery.com is on the Healthline list of the 18 Best Eating Disorder Blogs of 2012. Author, lecturer, and licensed psychotherapist Joanna Poppink has built a wonderful blog for people struggling with eating disorders. From self-esteem exercises to practical tips on symptom management, this expert dishes out advice and information on the nitty-gritty details of eating disorders.